Once we were done with our review we held a giveaway where ten of you awesome readers would enter to win your very own Diaper Genie Elite. Giveaway ended and Diaper Genies were sent out. What we asked for in return was that you send us your thoughts on your experience with the Diaper Genie. If you did you were automatically eligible to win a $50 gift card to Babies R Us. Well, it's been almost two months and we were sent in a few reviews. 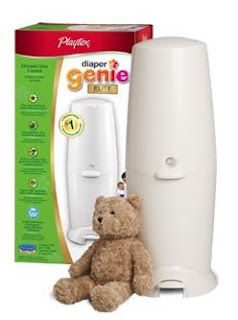 Here are a couple of our readers thoughts on the diaper genie. "I have been using the Diaper Genie Elite for a few weeks now and can honestly say that it works great.. I love how sleek and modern it looks in my daughters room. I'd like to thank each and everyone of you ladies that took the time in to$50 gift card to Babies R Us is....LENA! Congratulations Lena!